Gary Kohlenberg has challenged the nomination signatures for fellow Democrat Bryan Kennedy, attempting to eliminate Kennedy from the ballot to challenge veteran Rep. F. James Sensenbrenner of Wisconsin’s Fifth Congressional District, one of the nation’s most staunchly republican redoubts. Kennedy campaign manager Bill Elliott says the effort is “a full fledged smear campaign. … Kennedy and his volunteers collected well over the necessary 1,000 signatures. Kohlenberg is now attempting to get signatures thrown off the petition based on minor technicalities in order to prevent Bryan’s name from appearing on the ballot. The State of Wisconsin Elections Board will rule on the challenge Wednesday. What are examples of the challenges? The campaign has hired Jeralyn Wendelberger, an attorney and former member of the Election Commission to represent its interest. As usual, it appears the City of Milwaukee trumps the County of Milwaukee when it conducts the business of the people, in this case in the issuance of bonds. County Executive Scott Walker and Linda J. Seemeyer, his director of the Department of Administrative Services have come under fire for their recent granting of a county bond issue to Bear Stearns. The Bear Stearns office in Chicago, which handled the bond sale, was headed until recently by P. Nicholas Hurtgen. Hurtgen and Seemeyer are longtime acquaintances who worked in the administration of Governor Tommy G. Thompson. Hurtgen resigned his job after a scandal in the Chicago office regarding the issuance of a Chicago contract to build a hospital. Here in the county, missing records, faulty recollections and inaccurate statements clouded the issue of the award of the bond contract to Bear Stearns, which was not the low bidder in the case. In the city, things are done a little differently, said W. Martin (Wally) Morics, CPA, the elected City Comptroller, or “CEO,” as he likes to put it. There are two types of bonds issued by the city, according to Morics. The first is the General Obligation bond, which is an off-the-shelf, “plain vanilla item,” as Morics puts it, and involves the full faith and credit of the municipality. “We have to take the low bid on these,” he says. The other, more complex bonds, are called Revenue Bonds, and differ one from another. Examples of Revenue Bonds include those issues that may derive their funding from a specific source, rather than the entire taxing authority or credit of the community. These would include bonds for parking garages, or for Water Works facilities, or Port improvements. In these cases the revenue to repay the bond could possibly become impaired, and the bond issuer could stand to lose a significant sum if people stopped parking in city-owned garages, or if the Water Works dried up, or if the Port stopped receiving cargo. The City has done “10 to 15” of these over the course of Moric’s decade-plus as Comptroller. “Every single one we have done has had a Request for Proposal,” in which the City solicits bids for the bond underwriting. The proposals are weighed on a variety of factors including price and the structure of the bonds, Morics says. All are matters of public record, with public hearings, minutes, etc. The Bonds are reviewed and approved by the Commissioners of Public Debt, whose members are Michelle Nate, Margaret Henningsen and Tim Elverman. Bear Stearns wins some and loses some of these issues, Morics says. “One of the largest refundings we’ve ever done saved the city $7 million dollars. Bear Stearns got that one in 2002 when it was underwritten. Bear Stearns is known for wining and dining its customers, including the county. How did Morics fare with the Wall Street firm? Last week, www.milwaukeeworld.com revealed to the Milwaukee community plans for a new weekly paper in Madison to be owned by Capital Publishing, Inc. and operated by Catherine Nelson, the CFO of the Shepherd Express. The paper will operate in a rather saturated market that includes the Madison Capital Times, the Wisconsin State Journal (both owned by Capital Publishing), the Onion, two student newspapers and the Isthmus, whose editor Bill Lueders is one of the founders of the Shepherd Express. Milwaukeeworld emailed Lueders to get his take on the new publication, and he offers his opinion here. “I assume Catherine Nelson is her own person and sets her own course. I do think [Shepherd Publisher] Louis [Fortis] would feel aggrieved if someone associated with Isthmus set up a competitor to the Shepherd financed by the Journal Sentinel, and I’m pretty sure no one at Isthmus would ever do that to a fellow alternative. There is a fair amount of rumbling we’ve heard from people in the alternative press who consider Nelson a turncoat. I’m not sure that’s fair, but she is drawing on her ties to the weekly alternative press to increase the market share of a company that enjoys a near-monopoly on the Madison-area print press. “As for the new paper, I can only speak for myself, but I welcome the competition. I think Isthmus’ great strength is its arts and entertainment coverage. We have the city’s best editor, in A & E editor Dean Robbins, and a truly impressive cast of staff and freelance writers. It will be pretty hard to put out a better paper that focuses on this coverage area. If readers care about quality, and I believe they do, we’ll survive and thrive. As news reports have noted, the Beasties lining our streets have met more than their share of mayhem this year. One even took a swim in the Milwaukee River. I asked milwaukeeworld sponsor Bill DeLind of DeLind Gallery of Fine Art what happens to the critters after they get attacked? 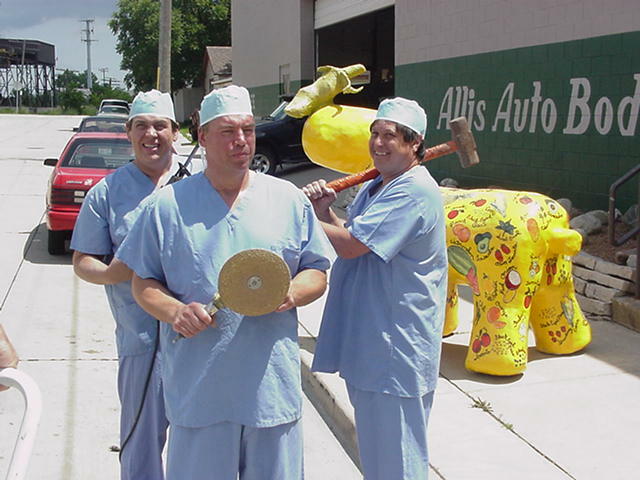 He responded with this comment and a photograph of the surgical team that mends the Dennis Pearson sculptures. “When the Beasties suffer the damages of hanging out on the street late at night, you have often heard me refer to taking them to the hospital. Here is a picture of the hospital, and the doctors that do such a splendid job of caring for them, and getting them back up on their feet quickly. Left to right: Bill Randa on the “Sawzall”. Bruce Parulski with the grinder, and Steve Feuling with the hammer. Our sponsor Jeff Farkas of American Conservators routinely encounters clients with paintings to clean and conserve. Recently a private collection in Milwaukee yielded quite a surprise for Farkas and his head conservator, Dmitri Rybchenkov. The painting has hung above a fireplace for many years, and depicted a smoky picture of a woman. As Farkas tells it, when Rybchenkov was cleaning the painting, various details showed up. For example, the woman was a young woman – about 14 years old. Her dress and jewelry indicated a possibility of royal stature. 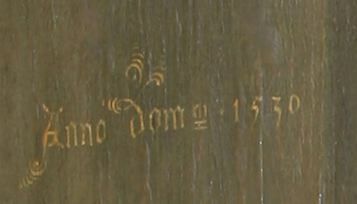 A bit later he discovered a date on the painting: Anno domini 1530. This sent the conservators scurrying to look at other paintings of the era, leading to a provisional determination that the painting was probably by Hans Holbein the younger, the court painter for the English royal family, and that the subject was most likely Mary Tudor, a.k.a. Bloody Mary (1516 – 1558), the last Catholic English queen. Rybchenkov was recently in the news when he testified in court regarding the fake Picassos you read about first here. He told me the works were cartoonish in their quality, and suspect in their materials. “Picasso usually drew with whatever was at hand, and these works were simply too studied and used too many materials,” he said. As far as the ownership of the Holbein, and its location, Farkas will not reveal any details, saying the owner has requested confidentiality. It is virtually certain the painting will remain in Milwaukee and will not be sold, he added.